DONETSK, Ukraine -- Pro-Russian separatists have intensified their shelling of government positions in eastern Ukraine, military officials say. A pro-Russian fighter guards the road near Donetsk airport. Four Ukrainian soldiers and two civilians have reportedly been killed in the latest violence in the Donetsk and Luhansk regions. Officials said the spike in attacks followed the arrival of a Russian aid convoy in the region on Thursday. The fighting comes ahead of peace talks mooted to take place next week. The foreign ministers of France, Germany, Russia and Ukraine have agreed to meet on Monday to discuss the crisis, according to the German foreign ministry. Ukrainian President Petro Poroshenko said in December that he planned to meet Russian President Vladimir Putin in Astana, the Kazakh capital, on 15 January alongside the German and French leaders. However, officials in Germany and France have not confirmed this. 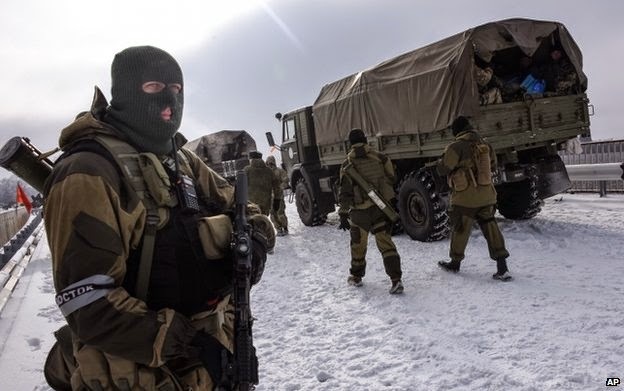 Ukrainian military officials said the soldiers had been killed following a surge in mortar and rocket attacks on army positions in eastern Ukraine. They claim the Russian aid convoy that arrived in the region on Thursday was used as cover for bringing military supplies to the rebels. Meanwhile separatist leaders in the rebel stronghold of Donetsk say two civilians were killed in clashes around the city's bitterly contested airport, AFP news agency reports. The airport, just outside the city, has been battered by shelling for months. A ceasefire in eastern Ukraine was agreed in September, but there have been many violations and tensions escalated when the separatists held elections condemned by Ukraine as illegal. NATO has condemned Russia's involvement in Ukraine and has plans for a "high readiness force" that could be deployed rapidly to Eastern Europe. The rebels seized official buildings in the east in April, soon after Russia's annexation of the Crimean peninsula. The rebels and Moscow accuse the pro-Western leaders in Kiev of having ousted former President Viktor Yanukovych illegally, and of threatening the rights of Russian-speakers. The rebels control much of the Donetsk and Luhansk regions. They accuse Ukraine of shelling residential areas of Donetsk indiscriminately from positions in and around the airport.